This entry was posted on 10/03/2017, in Corruption and Cheat, Editorials, Entertainment, Ethics | Morals, Laments, News | Newsmakers, Nonsense, Public Frustrations, Satire, Wits, Tragedies and tagged dinesh, Diyawanna nadagama, WW. Bookmark the permalink. TW recommend this interesting and worthy-to-read editorial for its wits, epithets, jokes, etc. etc. Wednesday’s Parliament drama, which may be called Diyawanna nadagama, had the trappings of a third-rate soap opera. It, however, served the government’s purpose in that it diverted public attention from a vital issue—parliamentary approval for allocating about half a billion rupees to buy super luxury vehicles for ministers and others. Surprisingly, an otherwise mild-mannered Speaker Karu Jayasuriya saw red when Joint Opposition leader Dinesh Gunawardena launched into a tirade against him, disrupting parliamentary proceedings in the process. Pulling a wry face, he recalled an incident, where Gunawardena, as the then Chief Government Whip under the Rajapaksa regime, had prevented him from even getting up to present the Right to Information Bill as a private member’s motion. The boot is on the other foot! Gunawardena, obviously, let emotions get the better of him and overstepped his limits. True, he had a grouse and thought the Chair was not giving him a patient hearing. He demanded to know why Wimal Weerawansa’s National Freedom Front, which had pulled out of the UPFA, could not be considered an independent party in the House. His diatribe against the Speaker, however, cannot be countenanced. We have seen MPs behaving in a far worse manner than Gunawardena in the House without being named or suspended. In 2007, the then Speaker W. J. M. Lokubandara, angered by a free-for-all in the House with some protesting Opposition MPs grabbing some of the files on his table, declared that what he had witnessed was terrorism. A minister once assaulted a manthri hamuduruwo or MP monk, injuring the pendulous parts of the latter’s anatomy in Parliament. Nobody was named or suspended for such rowdy behaviour. Two wrongs, however, don’t make a right and it is incumbent upon all MPs, especially the senior ones on both sides, to behave in the House. We only hope that the government won’t continue to have Opposition MPs named by the Chair and use its parliamentary majority to suspend them in the name of maintaining discipline in the House. 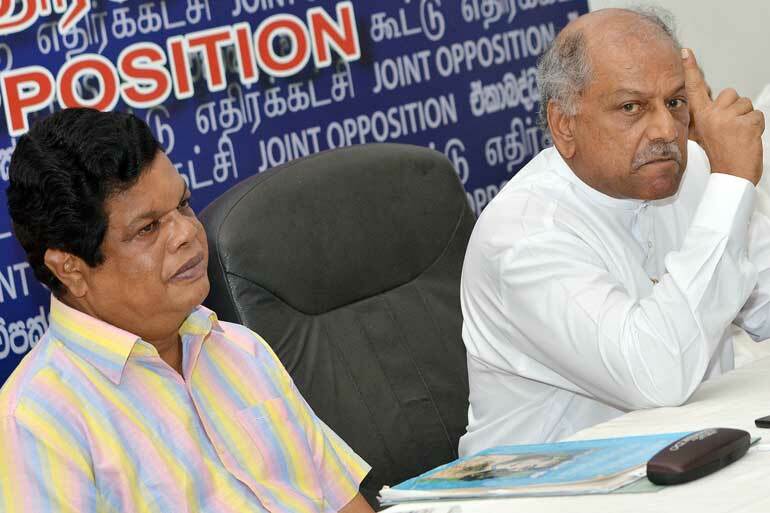 The yahapalanaya administration is becoming increasingly intolerant of political dissent. A question that needs to be posed to the party leaders in Parliament is why about 114 MPs were absent on Wednesday. MPs are paid salaries and various allowances and given duty free vehicles, soft loans and numerous other perks to attend Parliament and take part in debates therein on behalf of the public. Of what use are MPs who shirk their legislative responsibilities? Many schools are without sanitary facilities as President Maithripala Sirisena himself has revealed. Hospitals are experiencing drug shortages. Public assistance is sought for purchasing medical equipment. Foreign reserves are dwindling at a rate and the balance of payment woes are worsening. But, the government does not scrimp and save when it comes to feathering the nests of its parliamentarians. Having come to power, promising to run a tight ship and salvage the economy, it is wasting public funds to please unconscionable high-rollers within its ministerial ranks. Politicians in power are said to suffer from rathagaya or excessive desire for using vehicles. They love to have fleets of SUVs and limos at their disposal to boost their XXL egos. Some of them get into trouble after losing power as a result. Weerawansa’s predicament is a case in point. One may recall that a few years ago an MP monk caused quite a stir by purchasing a duty free car and disposing of it on the sly. The then Opposition Leader Ranil Wickremesinghe, known for his impish delight in riling his rivals and shocking the press, asked whether the Thera wanted a comfy sedan for his ‘journey along arya astangika margaya or the Noble Eightfold Path’. The JHU heavyweights hauled him over the coals for insulting Buddhism. Ironically, they have got into Parliament on Wickremesinghe’s coat-tails! The PM should be asked whether his ministers need so many super luxury vehicles to zip along the yahapalana path, which we are told, leads to political nirvana.